To start off my name is Amy Foster. 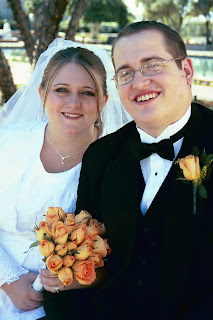 I married my wonderful husband Preston in the Mesa, Arizona LDS Temple on November 19th 2005. Obviously, we are about to celebrate our second anaversary in a couple weeks. It's been alot of fun and a great expirience for us both! In ways it feels like we've been married forever, and in others I could swear it was just yesterday! Either way, I can't imagine life without him! Anyone who knows us knows we were made for each other! That's enough mush... now on to business! Fortunatly, Preston's side is alot more straight forward. Thank goodness! Mom, Dad, one sister, and two brothers. There's a countable amount of aunts, uncles and cousins (of whom I've only met about five or six), and one silly Grandpa! (I'm told he's a 14-year-old stuck in an old mans body.) I also still need to meet Grandpa. To sum up... I love my crazy family and I wouldn't trade them for anything!!! By the way the puppy mentioned earlier is our newest addition to our little family. Our "baby". Charlie Brown Foster came home on October 9th and is just lovin' life! He's three months old as of the 1st of November, has demolished his stuffed pink platupus and his purple bunny and has already made a habit of sneaking into the master bathroom where his litter box in NOT at and leaves me little smelly presents. If he weren't so stinking cute I'd... I don't know... He's just too stinking cute! My little poo-head. Well I think I will wrap up for now and go to bed. Sleep! I need sleep! TTFN! Ta ta for now!